Canadian scientists have devised a way that allows them to turn left over beef carcass into plastic. 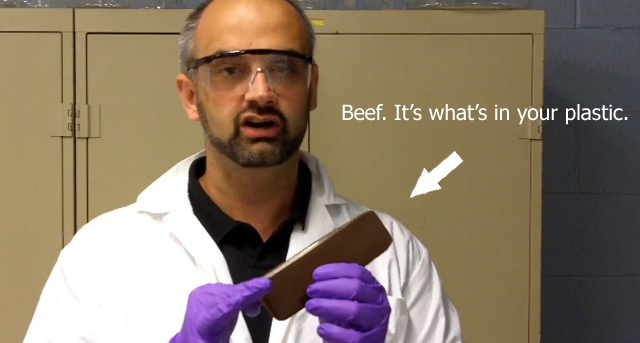 Currently in the developement stages, scientists at the University of Alberta are working with industries to try and implement these beef plastics into car parts, CD cases and other structural materials. Watch this video of Dr. David Bressler explaining their studies. According to the United Nations’ Food and Agriculture Organization, the meat industry is one of the major causes of the world’s most pressing environmental problems, including global warming, land degradation, air and water pollution, and loss of biodiversity. That being said, do you think this method of recycling meat carcass help or hinder the environmental movement? The scientists call it ‘ingenious recycling‘. What’s your take? To learn more about our company the reusable shopping bags we manufacturer visit us at FactoryDirectPromos.com and connect with us on Facebook and Twitter. Chicago O’Hare Goes Green and Gets On Board with Reusable Bags!